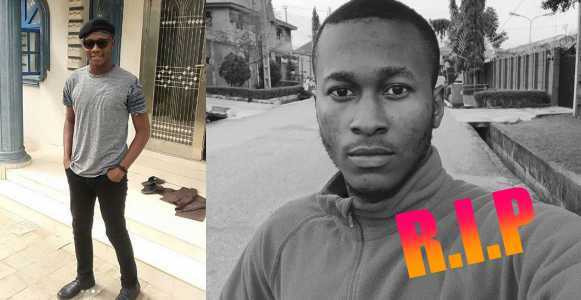 A grieving mother has cried out over the alleged murder of her son, Arnold Ogboru , by one Emmanuel Douglas Okpongete who is the landlord of his girlfriend, Calista, who is serving in Abak, Akwa Ibom State. 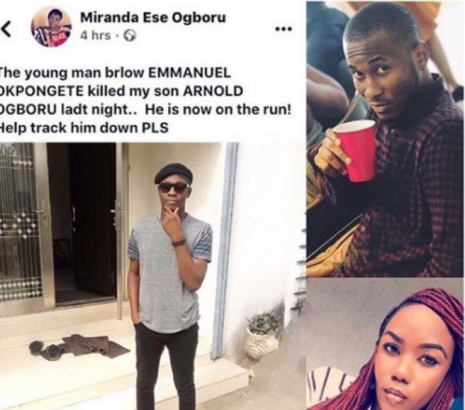 According to an email received by us, the deceased’s sister, Venessa, said: “Okpongete Killed my brother, Arnold, last night, and he is now on the run. All efforts by the police to get to him, have proven abortive. There was an altercation between them after Arnold tried to talk to him about invading his girlfriends privacy. Arnold’s girlfriend is the tenant to Okpongete. And she told us this story. She told my family that Okpongete, a 26-year-old native of Uyo Itam, Akwa Ibom state, had refused to hand over the spare keys of her apartment to her and constantly goes into her flat when she is not around. Arnold was visiting Akwa Ibom for the first time, to pursue a dredging business, his girlfriend Calista serves in Akwa Ibom as well. So they went to a resort together and decided to go back to her flat afterwards. On getting there, they found the shirt of Okpongete in her room. Calista told my brother that she had no idea how it got there and she confronted Okpongete on why he had gone into her flat again to drop his shirt. He replied, however, saying it is his apartment and he can do what he likes. My brother watched the whole altercation between his girlfriend and Okpongete (who is now the owner of the house following his fathers death). Arnold the decided to approach him and get him to hand over the spare keys to his girlfriend, however he became extremely angered and began to insult Arnold. That led to the fight between them. . While the fight was going on the gateman of the compound held Calista down to prevent her from separating the fight. Okpongete hit my brother’s head against the gate and he fell.